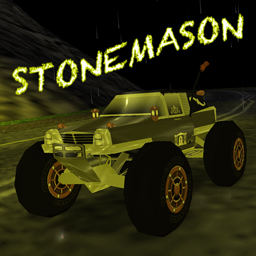 Here is the second own designed custom car, called Stonemason. Basically he is a mix of hearse car and rc crawler. I've given him an optical american hearse carbody, because at first the rc crawlers came from the USA to europe. Why it has the name "Stonemason"? Well, they working with Stone, they are often in cemeteries and rc crawler are generally designed to crawl over stones,rocks. On the carbody i've used a lot of details, like bronze vases as rear blinker like on theCitroen DS, bronze vase cover for the rims and bronze lanterns. The top of the aerial is create like a cross and the floral wreath is in a fitting position, like a spare wheel. The decals are inspired from hearse model cars in 1:43 scale. About his driving behavior, he has a bit slow acceleration but good topspeed. The steering is also a bit tricky but good to handle (it steers with both axles). With his soft suspension you must be careful in the curves with battery, but if you can control it, its not really problematic, imo.